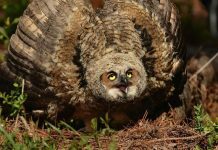 Home Nesting Behavior Great Horned Owl Predators – What Eats a Great Horned Owl? Great horned owls are the second heaviest owls in North America therefore it seems reasonable to assume that they don’t have any natural predators in the wild. However unlike adults young owls are particularly vulnerable to the potential predators like bobcats, feral cats, foxes, coyotes, and raccoons. It so happens that young owls in an attempt to check out too early, fall form the nest and become a straightforward feast for land mammals. Many owlets die in a similar fashion. This article is all about great horned owl predators and competitors. Mother owl with her owlet. Young owls do not seem to have any reliable defensive strategies so they are extremely susceptible to the predator. 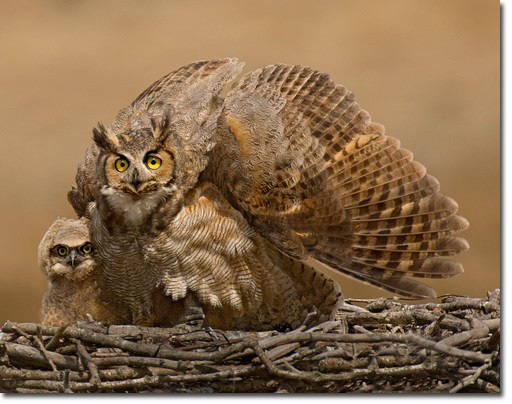 However, once they attain their full size, great horned owls become the predators themselves. They will potentially take down bird the size of a great blue heron. Prominent among the great horned owl predators are medium-sized to large land mammals including coyotes, feral cats, bobcat, Virginia opossum, foxes, and foxes. All these predators will steal eggs from the great horned owl’s nest and occasionally baby owls too. Sometimes ravens or crows can also consume owl’s eggs. Although parents are mostly there to guard the nest but sometimes the predator is just too big to be handled by an adult owl. For instance, American black bears may come around to feed on owl’s eggs and when they do it’s almost impossible for a mother owl to defend her owlets. Mother owl seldom leaves her owlets or eggs for a long time, it only happens when a flock of ravens harasses and force her to abandon the nest. While adults are relatively safer they do sometimes get killed by large North American eagles. 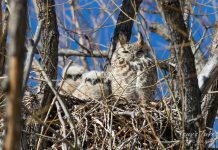 Why Do Great Horned Owls Die? The mortality rate is quite higher in young owls not because of their predators only, sometimes they fall prey to their own prey. 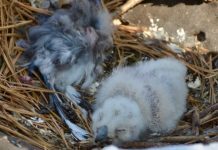 That is, young owls who aren’t skilled enough to take on animals such as porcupines or skunks, they get either killed or virtually disabled to die minutes later. These animals are so dangerous that they can disable owls by spraying into their eyes and leaving them blind. Rat snakes can also kill great horned owls. Studies suggest that more than 50% of owls die when they are about to leave the nest for the first time. The great horned owl’s habitat covers such as vast expanse of land that it must share its prey with quite many other birds of prey. 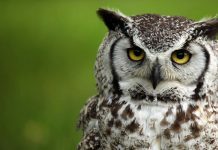 For instance in Michigan, both great horned owls and falcons eat meadow voles and in the Great Basin the desert cottontail and black-tailed jackrabbit turn out to be the common prey between owls and ferruginous hawks. Similarly diamond rattlesnakes are most likely to prey on many rodents, ground squirrels, cottontails, and snowshoe hares. Rodents make up 15 to 20% of the hawk’s and snake’s diet therefore they likely confronted with great horned owls especially when the food is not abundant. 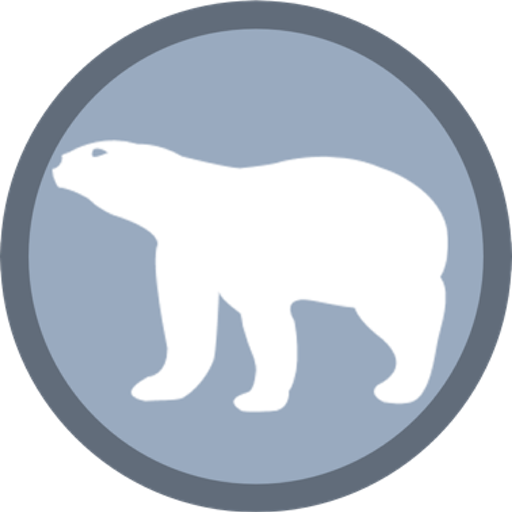 Some of the other competitors are wolves, cougars, wolverines, northern goshawk, and bears. Many researchers have also witnessed barn owls and long-eared owls attacking the same rodent although barn owls fancy choosing small rodents weighing up to 57 grams as against the great horned owl’s prey of 170 – 220 grams. However, it’s not always about the prey, sometimes great horned owls get harassed by a huge flock of birds one that force owls to abandon the nest. This includes northern goshawks, Harrier’s hawks, red-shoulder hawks, peregrine falcons, western scrub jays, Cooper’s hawks, prairie falcons, and American kestrels. Powell, B. 1984. Labrador by choice. Jesperson Press, St. John’s, NF. Houston, C. Stuart, Dwight G. Smith and Christoph Rohner. 1998. Great Horned Owl (Bubo virginianus), The Birds of North America Online (A. Poole, Ed.). Ithaca: Cornell Lab of Ornithology; Retrieved from the Birds of North America Online. Bibles, Brent D., Richard L. Glinski and R. Roy Johnson. 2002. Gray Hawk (Buteo plagiatus), The Birds of North America Online (A. Poole, Ed.). Ithaca: Cornell Lab of Ornithology.